Mega-producer Jerry Bruckheimer has tweeted a first look at his newest project, teh long gestating reboot of teh American classic THE LONE RANGER. 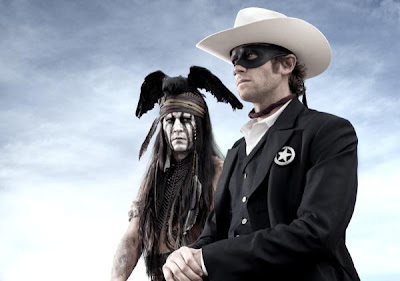 Bruckheimeer is producing the picture with with his frequent collaborator director Gore Verbinski (Pirates of the Caribbean 1-3, The Ring, Oscar™-winner Rango) with Johnny Depp as Tonto and Armie Hammer (The Social Network, J. Edgar, the upcoming Tarsem Sign film Mirror, Mirror) as the titular cowboy avenger. The film has had a troubled history, getting dumped at Disney for being over budget, Hammer was arrested in the Southwest for possession of marijuana, and well, in the age of super heroes and giant robots an epic cowboy adventure might be a tough sell to audience who didn't grow up with this iconic character in their collective memory. However, in a single pic (with the credentials attached), it already looks better than last summer's giant misstep Cowboys and Aliens.